Bamtex® continues to innovate the utilization of bamboo with its new decorative bamboo veneer, paneling and increasingly popular flooring products..
Our products offer a unique opportunity to provide a new design concept for the cabinet, countertop, furniture, fixture and display industries. Alternatives to timber as a construction material are being promoted to reduce dependence on hardwoods. With its physical characteristics and ability to regenerate rapidly, bamboo is one of the best means to replace hardwoods while providing similar properties and attractiveness. Environmental friendly bamboo, which is a grass, grows rapidly. While there are more than 1,000 varieties of bamboo, we use only Mao bamboo because of its color, structure, density and strength. This species allows us to use only the finest quality bamboo for our veneer and paneling products. 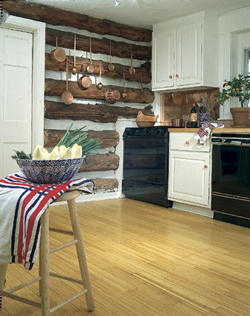 Our veneer can be applied to practically any surface and our paneling may be milled in a manner similar to hardwoods. Bamtex® bamboo products are in demand by customers because of their unique, simple elegance, as well as, their special grain and color. Bamboo has been utilized in commercial and sport environments as flooring, paneling, display fixtures and applied as veneer on walls, furniture, cabinets and doors. Bamboo is gaining acceptance and growing at a rapid rate within the U.S. The Chinese have been using bamboo for over 4,000 years. China is the largest producer of bamboo products in the world. Bamboo grows mainly in South China and covers areas in excess of 2,000,000 square miles. Historically, bamboo has been used primarily for daily accessories, such as, chopsticks, cups, tables and chairs. More recently, bamboo’s many attributes have gained attention and allowed it to be used in a variety of construction applications as an alternative building material. Bamtex® has worked with its suppliers to more fully develop the veneer, paneling and flooring markets throughout the world. Today Bamtex® markets its products in the North American and European territories and intends to move into the Middle East, shortly.